Established in 2004, CSV Capital Partners focuses on investing in and helping early-stage and emerging Chinese companies quickly become successful. CSV aims at investing in promising young companies and then introducing and leveraging them into the global markets through the experiences and contacts of our team. CSV is open to investing in a wide range of industry sectors including the Internet, outsourced services, IC design, wireless, traditional media, energy/environmental, consumer goods/retailing, and the life sciences. CSV's partners combine extensive private equity, operating and China market experiences to assist entrepreneurs in creating industry-leading companies. Headquartered in Shanghai, CSV offers access to high quality partners in Asia and the United States and an extensive network of resources to support its portfolio companies. 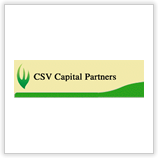 CSV has a strategic relationship with US-based Babson Capital Management LLC.